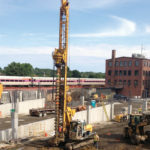 To support the growing need for public transit in Massachusetts, Nobis was selected to provide geotechnical engineering and environmental services for the design and construction of a 540-space mixed use parking garage facility – a priority transit-oriented project for the MBTA’s commuter rail system to expand ridership. 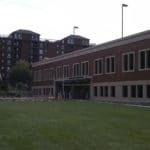 The project included a three-story, multi-use addition built directly above the parking structure. From former light manufacturing and railroad support facility use dating back to the 1800s, the site included legacy underground storage tanks and was impacted by past environmental releases. Massachusetts Department of Environmental Protection classified the property as a past disposal site and had placed deeded use limitations on it. 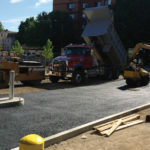 Nobis provided site design services including site grading and utility layout, storm water management, and streetscape improvements. Landscaping plans were also developed that incorporated native and adaptive plant species and low impact design and maintenance considerations. 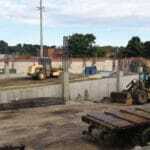 A geotechnical subsurface exploration program and foundation design support was also performed. 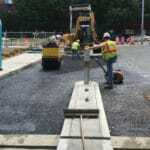 Construction phase support including construction documentation, contaminated soil management, soil improvements and dewatering support was also provided. During the design phase, Nobis discovered underground utilities without sufficient as-built drawings and records indicating their presence and function. Located in an urban area, it was spatially difficult during construction to stockpile and properly test contaminated soil. Challenging soil and subsurface conditions caused settlement concerns at the locations of proposed retaining nearby to the railway and a pedestrian walkway. To locate and identify the unknown underground utilities, Nobis conducted extensive CCTV inspection and dye testing and successfully incorporated this new data into the overall site utility design. Nobis revised their soil sampling protocols whereby they pre-characterized soils at the excavation locations which allowed for the “live loading” and eliminated the need for on-site stockpiling. Nobis developed and put in place several new ground improvement recommendations that successfully address on-site settlement concerns for the new structures. Nobis completed the design and the garage was successfully constructed. 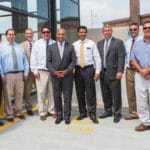 The MBTA continues to promote this project as a model Transit-Oriented Development project, and is currently planning for the development of an apartment complex adjacent to this new commuter rail parking facility.